Can Leo the Late Bloomer Guide the Celtics to the Championship? The Sports Guy compares the Celtics young point guard Rajon Rondo to Leo the Late Bloomer. "Not only has Rajon Rondo's belated emergence been the most fascinating subplot of a storybook Celtics season, but he's just like the character in that book. Like Leo, Rondo never spoke. Like Leo's father, Celts fans spent an inordinate amount of time wondering when Rondo would "draw" (in this case, play with consistency) or "write" (in this case, bang home open jumpers). Leo had patient parents who believed in him; Rondo had veterans such as Kevin Garnett and Ray Allen, role models who provided the confidence and toughness he desperately needed, eventually springing him from his on-court shell and altering the course of his career." Read the full article here. Next week he uses Kevin Sherry's I'm the Biggest Thing in the Ocean! to put the New England Patriot's failed bid for an undefeated season into perspective. So you want to be president? Well, be prepared to be sent through the ringer, my young friend. All presidential candidates must endure an unbelievable amount of scrutiny, but this year the long arm of the internet has really taken it up a notch. This election will undoubtedly go down in the history books as the YouTube election. From Obama Girl to McCain's 10,000 years to Clinton's Bosnia travails, YouTube exposure is playing a huge role in selecting our next president. So the burning question is: How would past presidents have been affected by the all seeing eye of YouTube? 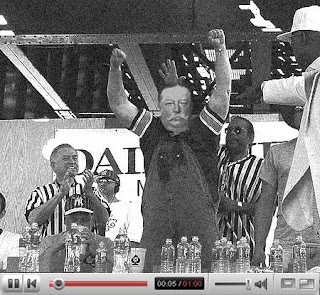 His 1909 election was nearly cut short when the embarassing footage of Taft winning the 1897 Cleveland Deviled Egg Eating Contest hits the internets. 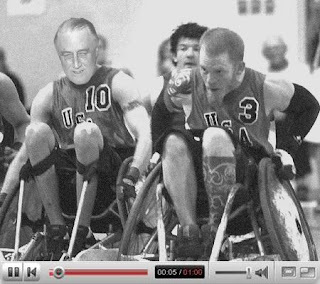 FDR's presidency was severely challenged by this leaked footage of him playing Murderball. His poll numbers took a plunge, not because America realizes that their president is in a wheelchair, but because he only scored one point and fouled out midway through the second quarter. 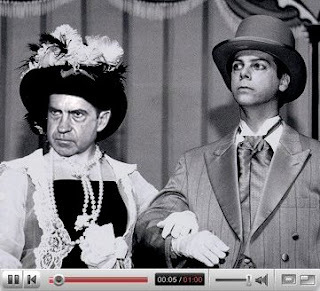 This clip of Nixon's star-making turn as Eliza Doolittle in the Whittier College Drama Club's production of My Fair Lady actually helped Nixon's popularity by revealing his seldom seen human side. We'll keep searching the archives for more long lost YouTube gems, so stay tuned! To crap on my books with this big-budget sludge. 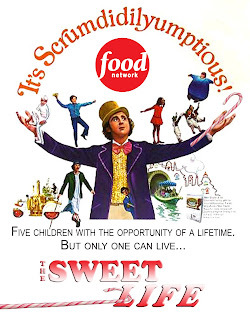 Not commercialous slop for Jim Carrey to ruin." The American Heart Association just released a report saying that mouth-to-mouth is no longer necessary when performing CPR. They are hoping that this will make it easier for people to jump in and save someone's life... but what they failed to take into account was that they are doing irreperable damage to the lifeguarding industry. Not only have they have taken some of the shine off of the Baywatch franchise... but they have squashed the hopes and dreams of kids like the heroic Michael "Squints" Palledorous. "What he'd done was sneaky, rotten, and low... and cool." But no longer possible. This is truly a sad day. Hopefully, it is just the American Heart Association's idea of a funny April Fool's Day joke... and tomorrow we can all go back to saving each other by making out.